The quaintly named Buttery books are in fact the domestic accounts of each member of the College for meals and services provided by the buttery, including candles and washing the hall linen. Exeter College has a good run of these early account books covering 150 years from the late sixteenth to the mid-eighteenth century, a period in which the books trace a resurgence of the College’s fortunes after William Petre’s re-foundation of the College in 1566, and then a gradual decline after the upheavals of the Civil War. 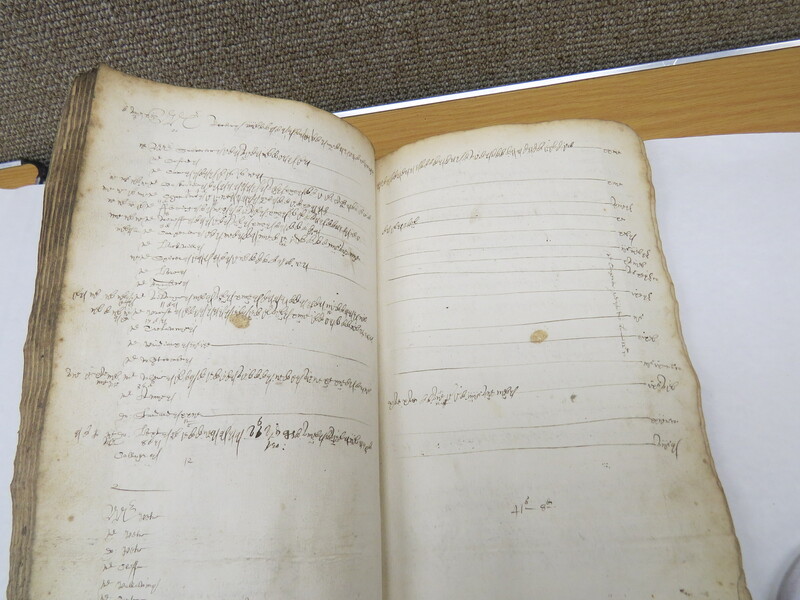 The books were kept for a full 52 week year divided into 4 terms of 13 weeks and record daily amounts for food and drink, with weekly totals and calculations and notes about suppliers and debtors on the front and back pages. 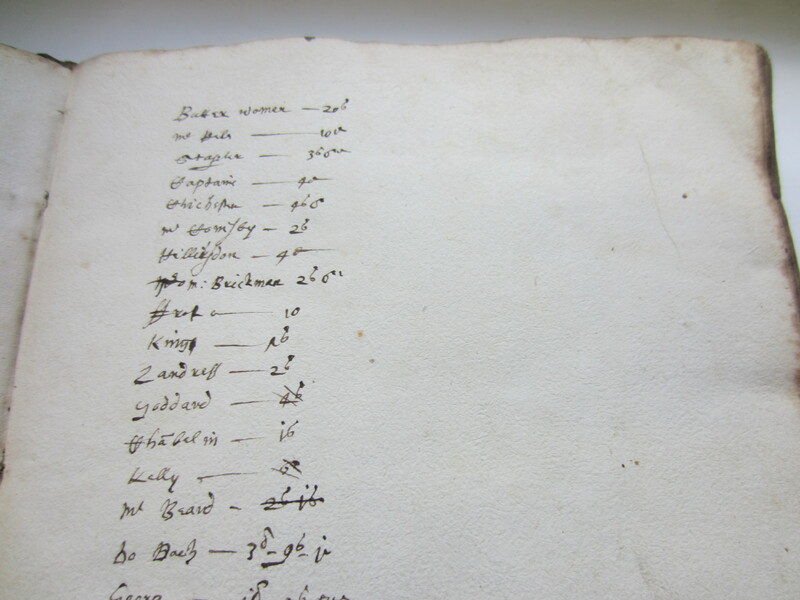 The daily records are all in roman numerals with superscripts for pennies (d), halfpennies (ob) and farthings (qua) and are very difficult to read especially in the earlier volumes, but arabic numerals become more common later. Some books include payments to suppliers and kitchen workers including butter women. 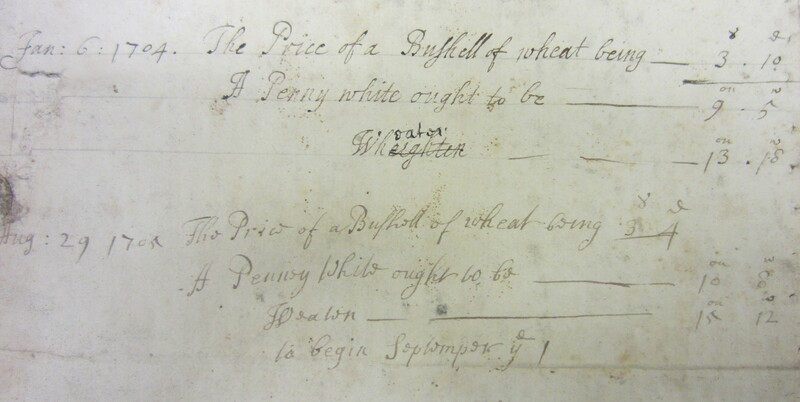 Exeter also has a book of ‘Directions for the Buttery Book’ from the 18th century setting out the College’s allowances and charges – for example 2 shillings and sixpence a quarter for all those admitted to the Library (at this time, only Fellows). 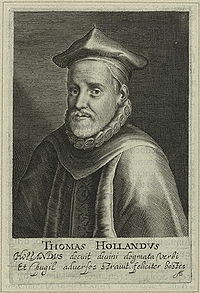 At that time, the English Calvinist scholar Thomas Holland was the College rector. He had studied at Oriel, and Balliol, and was appointed Regius Professor of Divinity in 1589. His election as rector in April 1592 was disputed by the members who had elected one of their own, but with the backing of Sir John Petre and Queen Elizabeth I, his position was confirmed. He remained in royal favour and was one of 47 translators of the Bible appointed by James I after the Hampton Court conference in 1604. 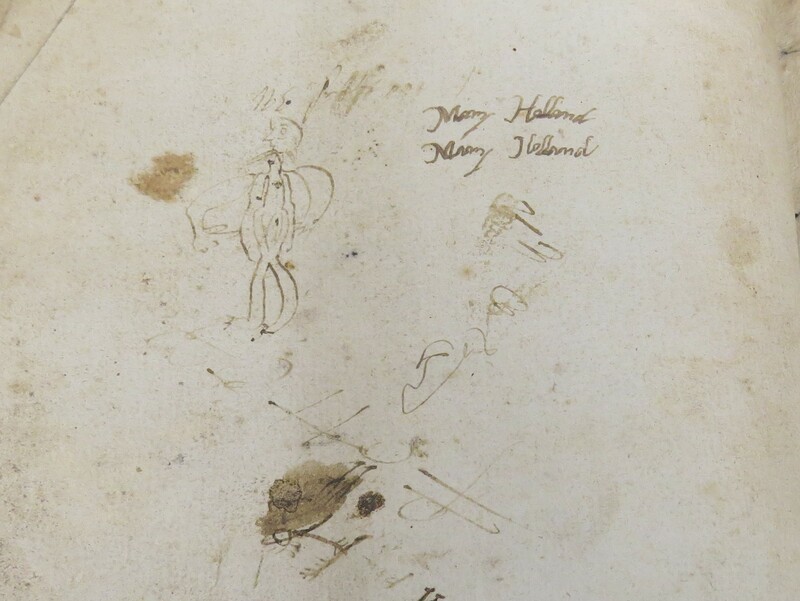 At the back of the 1605-06 Buttery book there is a caricature and two versions of a signature, Mary Holland. Both the identity of the figure and the person who drew it remain unclear. 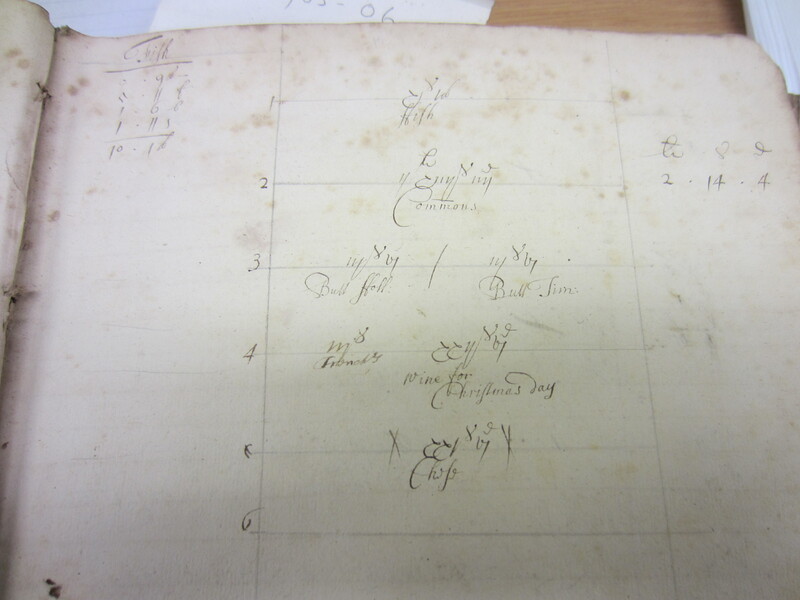 Our second example, the 1705/6 buttery book, was compiled in Rector William Paynter’s time. In Christmas week 1705 (the first week of the third term) there is an account for Christmas dinner, including xxii s vii d (22 shillings and sixpence) for ‘wine for Christmas Day’ and almost the same amount xxi s vi d (21 shillings and sixpence) for cheese. On the back boards the weight of a penny loaf was calculated. This varied seasonally, increasing in size after harvest and reducing in weight as grain prices increased before the next harvest. 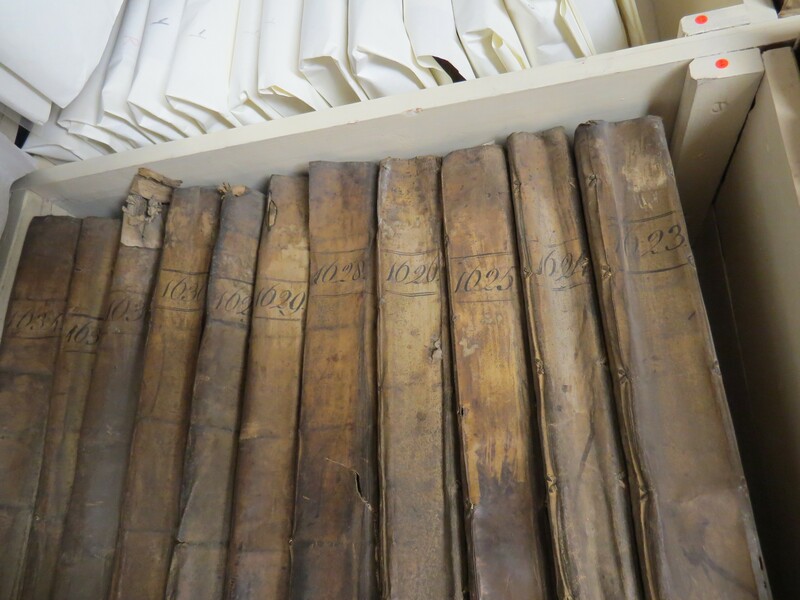 The books are tall and thin, bound with vellum over boards, a sort of early ‘soft-back’. 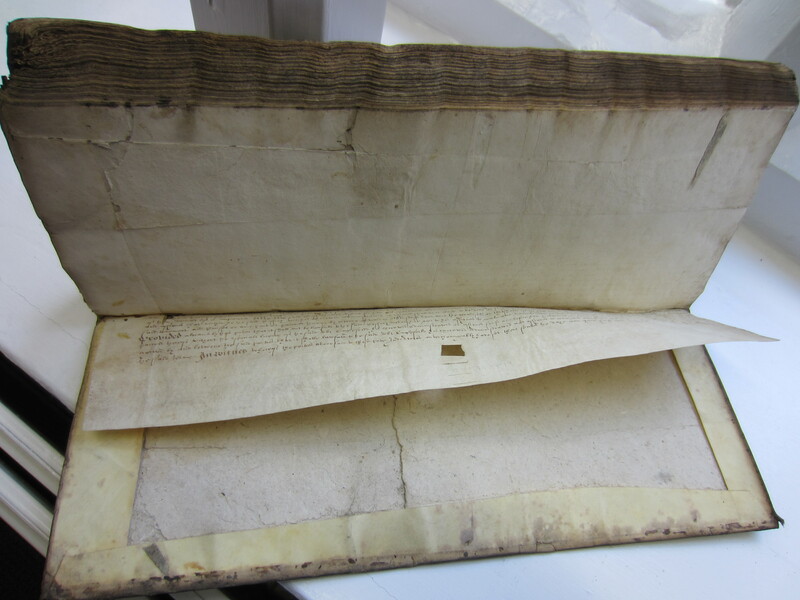 Some have an inner binding of old parchment deeds or printed papers. They were used daily and this heavy usage and subsequent neglect has taken its toll on their condition. 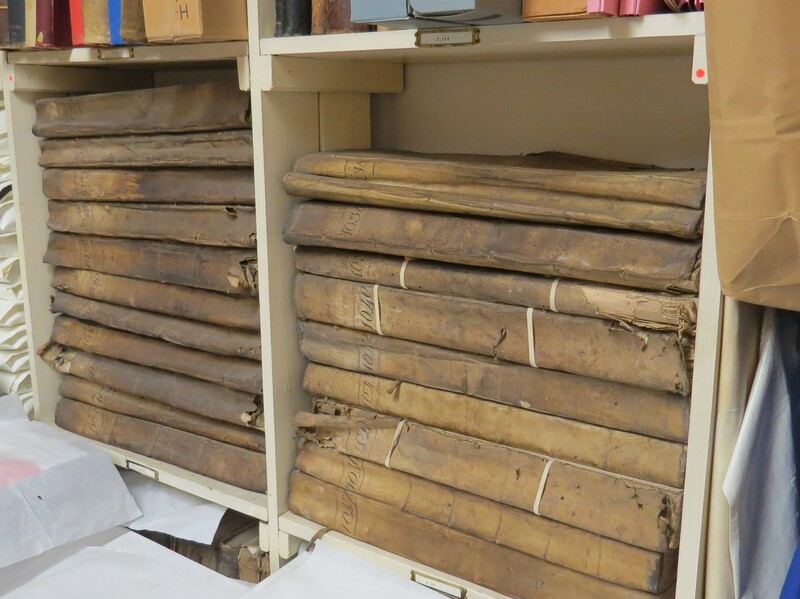 They must all be cleaned and boxed before they are moved to the new special collections centre and some require more extensive conservation. 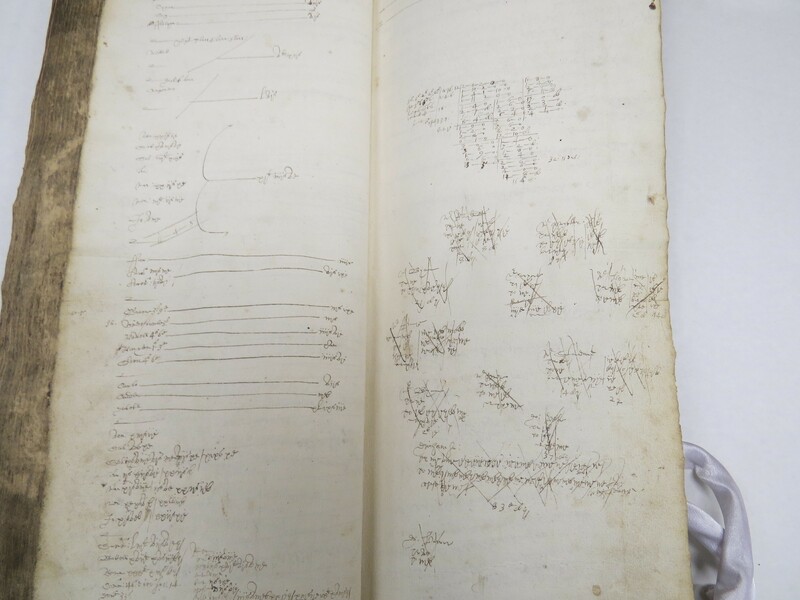 In the longer term it is hoped we can digitise this precious historical resource.